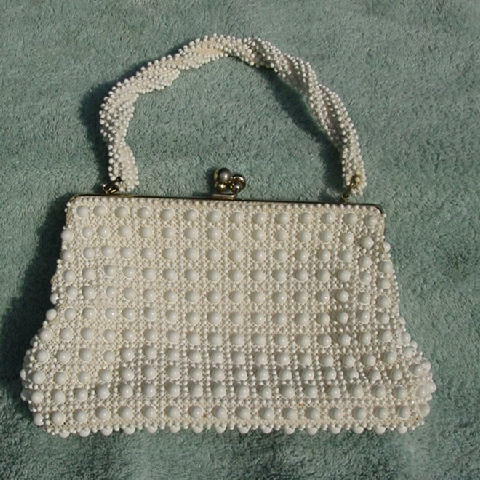 This vintage white beaded purse is by Lumured Croche-Bead and was made in the USA. It has rows of tiny and large beads. There is a white fabric and net background. There is some slight soiling to the upper sides near the rims and one area to the right center below the 2nd row of large beads. It has a large bypass closure with a textured upper center rim. There is a twisted 16" handle with tiny beads. 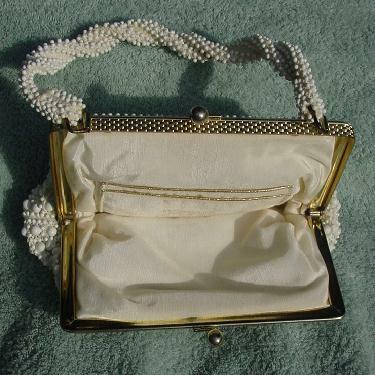 There is an antique white shiny padded fabric lining with two open pockets on one side. It has several small blue ink marks to the left of the pockets.